"Good nutrition is key to a child's healthy brain development. As a pediatrician, I know how hard it is to get children to eat a well-balanced diet, especially for hard to get nutrients like Omega 3 DHA and Vitamin D that are key to healthy development. SmartyPants helps parents ensure their children are getting all the nutrients they need." Zinc 5 cups of cooked summer squash, 7 cups of steamed broccoli or 3 cups of steamed shrimp. Iodine 4 hard boiled eggs, 8 cups of strawberries, two cups of 2% milk. Folic Acid 3 cups of steamed brocc, 6 cups of cauliflower (boiled), 1 cup of spinach (boiled), 6 cups of green beans (boiled). Vitamin D 3 1/2 ounces of baked/broiled salmon, 4 cups of 2% milk, 24 ounces of cod, 15 eggs. Vitamin B6 1.33 mcg 1 1/2 cups of bell peppers, 4 oz of garlic, 2 bananas, 4 0z of baked/broiled yellowfin tuna. 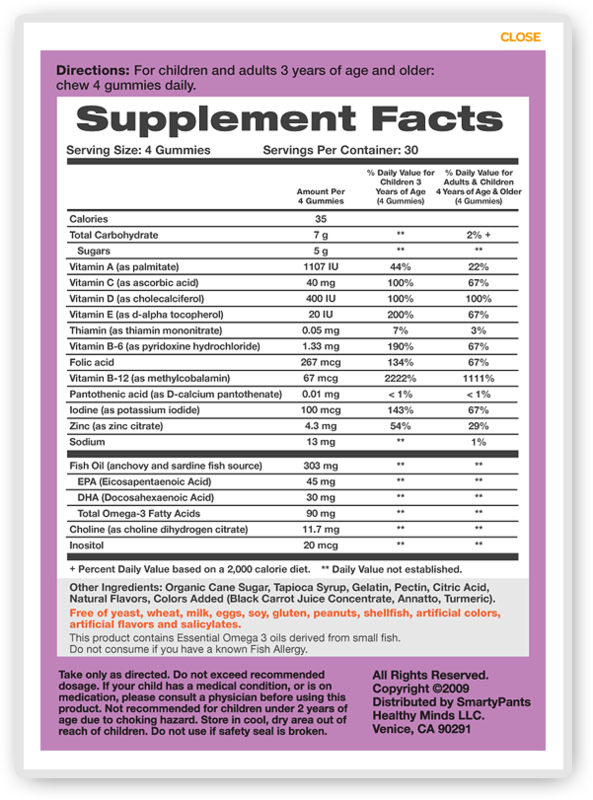 Omega 3's Calorie for calorie, one serving of SmartyPants has the same amount of Omega 3's (90 mg) as Pacific Cod, Tilapia or Canned, Skipjack or Yellowfin Tuna. Pediatricians and parents agree, if a vitamin does not taste good, kids will not eat them. So, we took the doctor's advice and sweetened SmartyPants with organic cane sugar. Organic sugar tastes good, helps facilitate your child's absorption of the micronutrients in SmartyPants, and does not have unknown future health risks the way non-sugar or artificial sweeteners do. 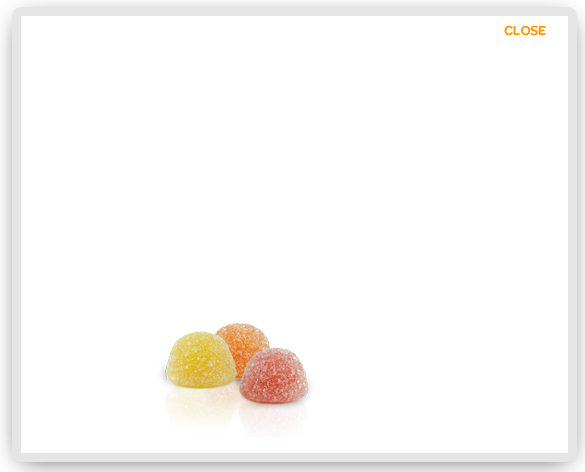 We are very conscious of the amount of sugar we give our own children and believe that less is more. We use the least sugar possible and only have 5g per serving which is 80% LESS sugar than in a glass of unsweetened apple juice. We dust the outside of SmartyPants with sugar to keep the gummies from sticking together and sticking to little fingers. SmartyPants offers fast, easy, and useful information & tips about brain health for busy parents like you. We source all our information from leading peer-reviewed journals and prestigious news publications. We provide links to the original research for your convenience. See our BrainFood guide to learn about key brain nutrients, foods, and kid-friendly Recipes. to help your child's brain develop. 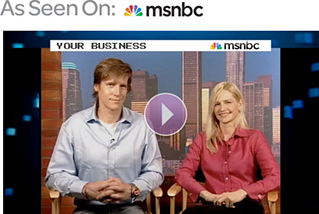 We started SmartyPants because we wanted to help our children thrive. All our information comes from leading brain health medical researchers and prestigious news and academic publications. We are committed to producing high quality, useful content and providing full transparency about where we get our information. See our BrainFood and BrainPlay guides for to learn about brain-health food & nutrients and fun brain-building activities. 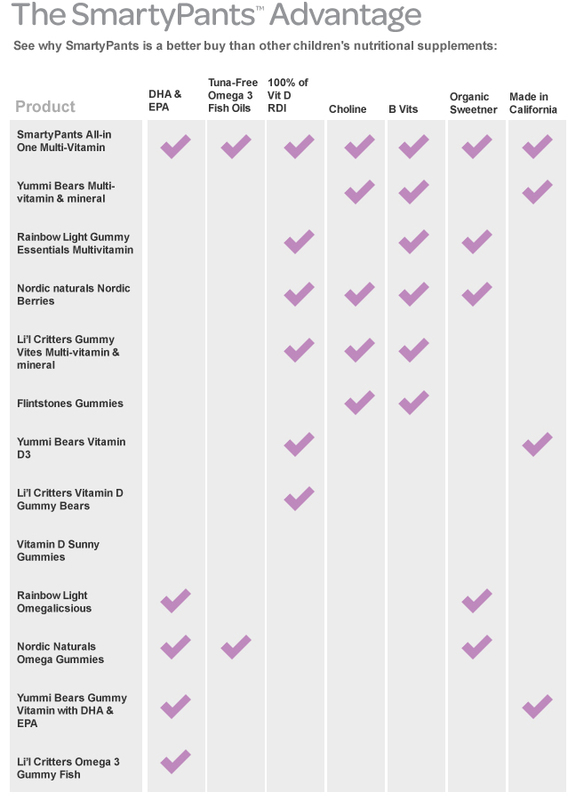 When it came time to create our SmartyPants Gummy Multi-Vitamins, we only wanted the best since we would be giving the SmartyPants Gummies to our own kids. As such, we sought out the highest quality ingredients and best manufacturing partners. For our vitamin mix, we turned to Glanbia's Facilities... a global leader in high-quality supplement ingredients. Glanbia facilities are kosher, halal, and FDA HACCP (Hazard Analysis and Critical Control Points) certified. Once we had our ingredients we partnered with Santa Cruz Nutritionals, the leader in high quality gummy production, to manufacture our SmartyPants Gummy Multi-Vitamins. SCN has received an Excellent Rating from nationally recognized product safety experts NSF Cook & Thurber for Santa Cruz Nutritional's GMP (Good Manufacturing Processes) standards. SCN is also fully compliant with the FDA's 21 CFR Part 111 vitamin supplement directive and has a Quality Assurance International (QAI) Organic Certification for all organic ingredients. 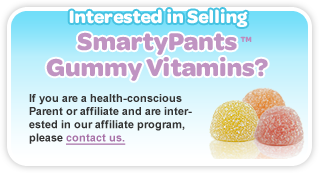 Finally, we submitted our finished product, SmartyPants Gummy Multi-Vitamins, to an independent third party to test for purity and FDA-compliant product stability testing. We passed with flying colors.